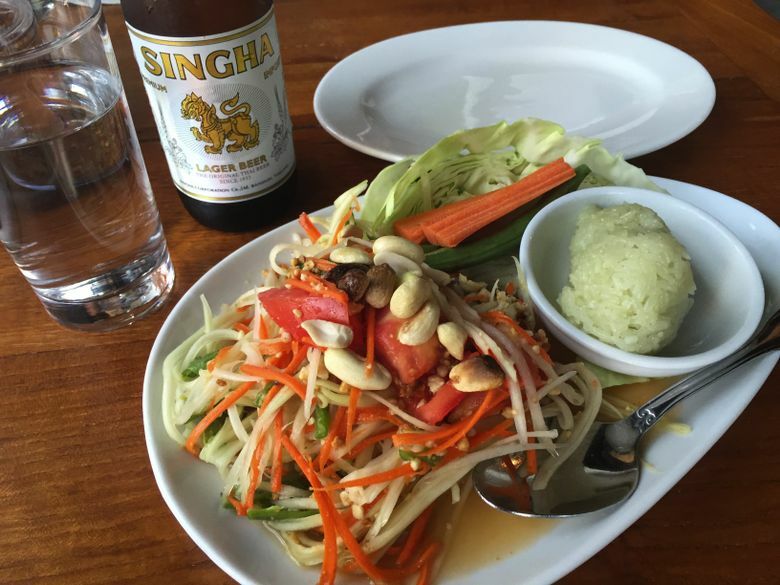 Manao offers the authentic tastes of Thailand. Standing out in a town with more than 100 Thai restaurants is no easy task. 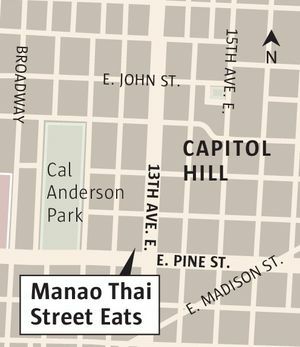 But Manao Thai Street Eats on restaurant-saturated Capitol Hill, one of the latest entries into this crowded field, manages to do just that with the buzzing atmosphere and vivid flavors one would expect on the busy streets of Thailand. 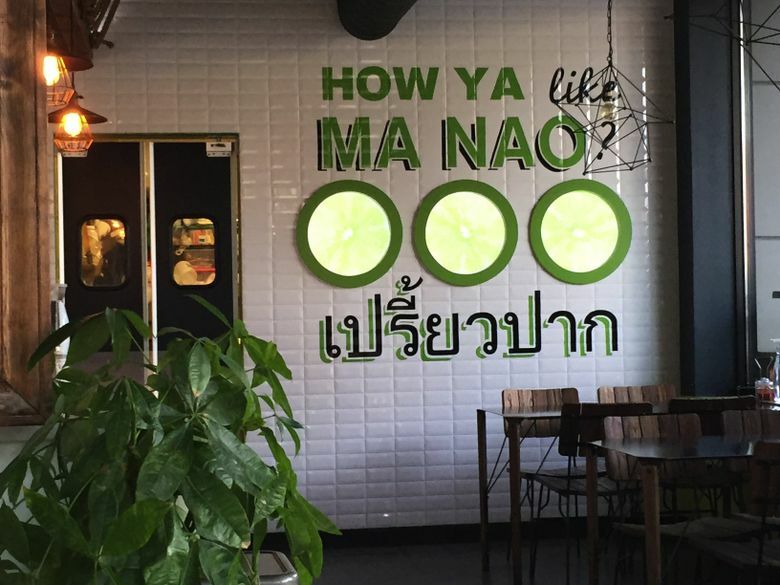 The menu: Like any self-respecting street-food joint, Manao posts its offerings on a board up front. The appetizer, soup and salad offerings include crispy chicken in tangy pandan leaf sauce ($9) and moo khum whan, marinated and grilled pork tenderloin on a bed of shredded cabbage with green beans and the restaurant’s house sauce ($12). Not surprisingly, the noodles section includes phad Thai ($9) and a well-above-average phad kee mao ($10). Phuket fried rice with seafood, Kaffir lime leaves and lemon grass and chili paste ($14) and red curry fried rice ($11) highlight the rice dishes. The signature entrees list includes herbal crispy chicken in a sauce spiked with lemon grass, galangal and tamarind ($12), deep-fried, crispy garlic trout ($17) and two pork belly offerings, one with basil, mushrooms and garlic ($12) and another with green beans and red curry paste ($12). What to write home about: The phad prik khing crispy pork belly ($12) is a fun mouthful to pronounce and to eat — tender morsels of fatty, cracklingly crisp pork belly mixed with citrusy Kaffir lime leaves, green beans and red curry paste loaded with funky fish sauce. Have it with yellow-hued turmeric rice at no extra charge. The setting: Lots of windows, reclaimed wood walls, steel tabletops, industrial pendant lights, an open kitchen and splashes of lime green add up to a dining room that is rustic yet stylish. Summing up: Tom yum soup ($7), Thai hot wings ($9); phad kee mao with tofu ($10) and phad prik khing crispy pork belly ($12) came to $38 plus tax and tip for two people.